1 How large is Costa Rica? 2 What’s the tallest mountain? 4.1 How deep is Lago Arenal? 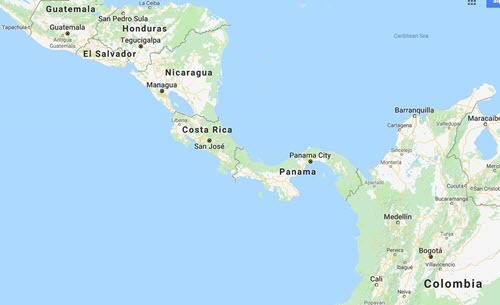 Costa Rica is one of the countries that make up the Central American Isthmus, and has the Pacific Ocean to the west and the Caribbean Sea to the east. To the north, Costa Rica shares a 313 km long border with Nicaragua to the north and a 348 km long one with Panama to the south. Costa Rica is characterized by coastal plains separated by the rugged mountain ranges Cordillera Central and Cordillera de Talamanca. These two ranges are referred to as the “spine” of the country and they constitute the divider between the Pacific watershed and the Caribbean one. How large is Costa Rica? Costa Rica is 51,100 square kilometers, of which 51,060 square kilometers is land. It is somewhat bigger than the Dominican Repblic but smaller than the U.S. State of West Virginia. Cerro Chirripó is the highest mountain in Costa Rica. The name Chirripó means “land of eternal waters” in one of Costa Rica’s indigenous languages and is a reference to the many lakes and streams in this area. Cerro Chirripó is located with the Chirripó National Park, a popular ecotourism destination noted for its high biodiversity and many endemic species. Climbing the peak is not permitted without permission from the National Park office in San Gerardo de Rivas. Despite being so close to the equator, the temperature at the peak typical stay in the 4˚C–18˚C range. On cold nights, it can drop to subzero. Snow has not been recorded here in a hundred years, but sometimes it hails. Costa Rica’s mountainous terrain have led to the formation of many river systems. Some rivers first drain into Lake Nicaragua or Rio San Juan, before their water eventually makes it to the Caribbean. This includes Rio Sapoá, Rio Frío, Rio San Carlos, and Rio Sarapiquí. Situated in Costa Rica’s northern highlands, Lago Arenal is the country’s largest lake. It’s size was tripled in the late 1970s due to the construction of the Arenal dam, and is now 85 square kilometers. The two dominating fish species in Lago Arenal are rainbow bass and machaca. The surrounding area is noted for its rich wildlife and is home to over a hundred different mammal species, including jaguars and tapirs. From November through April, prevailing winds attracts windsurfers and kitesurfers to the western part of Lago Arenal. How deep is Lago Arenal? Roughly between 30 and 60 meters, depending on the season. The Arenal dam was constructed as a part of a major hydroelectricity project to provide the country with electricity. The towns Arenal and Tronadora were flooded and the ruins remain at the bottom of the dam. Nuevo Arenal (New Arenal) and Nuevo Tronadora (New Tronadora) were built to replace them. Laguna Poco Sol is a volcanic lake in Costa Rica’s Cordillera de Tilarán. Located at an altitude of 789 meters, the lake lies in a 200 metres wide depression, and extends down for circa 11.5 meters. Exactly how the lake was formed remains unknown; it might be a crater left by a phreatic explosion or maybe a landslide scar. Which ever the event, it probably took place during the Pleistocene. The area is rich in volcanic features, including lahar deposits, tuff and breccia. Hot springs and mud spots are found both by the lake and at the nearby Rio Peñas Blancas.